Early Firebird 1.0.x versions did not include a control panel applet to start/stop the server (as known from Interbase 6 Open Edition). So I've created my own "Firebird Control Panel Applet". Since Firebird 1.5 now includes a native "Firebird Server Manager", I decided to rename my CPL to "Firebird Control Center" to avoid confusion. Intergrates nicely into Windows Control Panel on Windows XP, Windows Vista, Windows 7, Server 2003, Server 2008, Server 2008 R2. Control whether the server starts up as a service (Windows NT and up), or let the server run as an application. 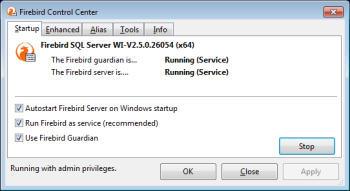 Configure Firebird to use the Firebird Guardian. Guardian will restart the server process in case of a crash. Set autostart option. Normally, the Firebird server is automatically started on Windows startup. Put Firebird Control Center into system tray. 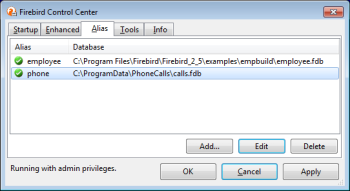 You have access to all Firebird Control Center functions by clicking the tray icon. Integrated alias manager. View, create or edit database aliases which can be used by client application to access database on server without knowing the exact file path. Use the Tools Manager to register your favourite Firebird Tools into Firebird Control Center Tray Icon. If installed, FlameRobin is automatically detected and added to the tools menu. View the Firebird Server log file, access the firebird.conf file or open up a Windows Explorer in firebird's root directory. 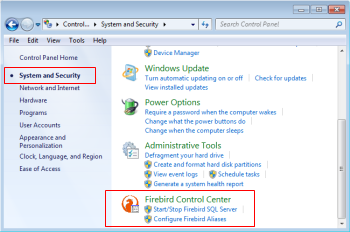 Due to registry key changes in FB1.5, the Firebird Control Center is not compatible with Firebird 1.0.x. If you need a Control Panel for Firebird 1.0.x, please download fbmgr V0.22. Firebird Control Center is not able to switch between different Firebird server instances (for example switch between Firebird 1.0 and Firebird 1.5). If you would like to have both Firebird 1.0 and Firebird 1.5 running on the same machine, please look at InterBase and Firebird Coexistance-Project on Sourceforge.net. This package is Free Software available under Mozilla Public License V1.1. Software downloadable here is distributed on an "AS IS" basis, WITHOUT WARRANTY OF ANY KIND, either express or implied.